I wanted something funny/ scary. 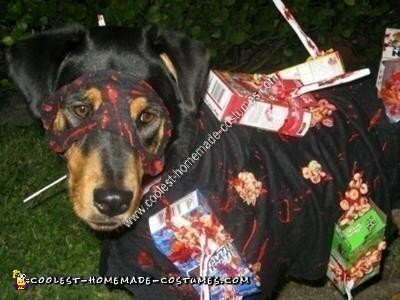 The handmade Cereal Killer Dog costume idea came from my dog attacking tearing apart a cardboard box. I also made the same costume for myself. Used a black dog coat made with 2 velcro belts sewn at chest & waist level as well as neck velcro’s on so costume doesn’t fall off because of weight. 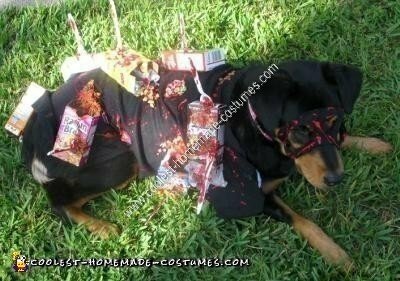 Simple dog coat patterns can be found online for free. I glued on mini cereal boxes, cereal & box tops. Used lots of super glue clear gel glue & scribbles red paint & some red blood and plastic silverware. First I stabbed boxes with cutlery & torn the boxes. 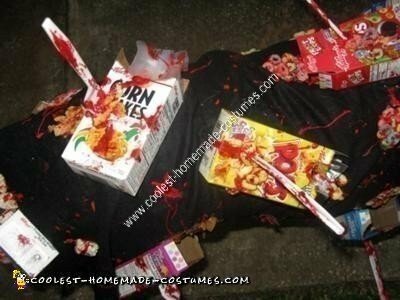 Glued cutlery to boxes with superglue let dry then add red paint & fake blood, glued on cereal added paint let dry. Made cereal clusters to glue on costume by making a small mound of glue adding cereal. 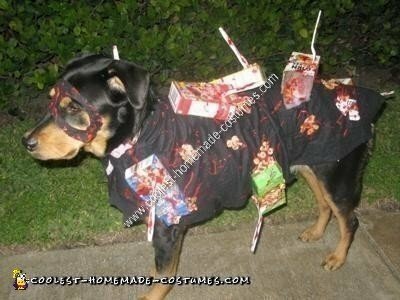 Glue boxes & cereal clusters to dog coat with mix up superglue & clear glue. Use sew on Velcro & sew on or use glue mixture self adhesive isn’t that strong.